The residential property market may be cooling down in terms of actual sales due to credit-tightening measures by banks, according to real estate consultants and Bank Negara data. Bank Negara's website showed loan approvals' percentage for residential properties in the country declined to 46.8% in the first half of this year from 50.1% during the same period in 2011. The number of loans applied for purchases of residential properties increased by 2.9% year-on-year in the first half of this year to RM96.7bil. However, the number of residential property loans approved during the six-month period declined to RM45.26bil from RM47bil in the same period in 2011. It is also worth noting that the loan approval percentage for non-residential properties was stable at 52.3% in the first half of this year, compared with 52.4% during the same period in 2011. The number of loans applied (RM50.35bil) and approved (RM26.35bil) for purchases of non-residential properties was also stable in the first half of this year. 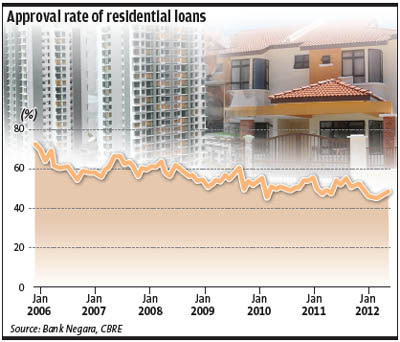 CB Richard Ellis (Malaysia) Sdn Bhd executive director Paul Khong said if the housing loan approval rate continued to decline, it will affect residential property prices. “In order to conclude transactions, residential property sellers may now need to realistically adjust their selling prices as many of the buyers cannot get their loan applications approved,” he said. KGV International Property Consultants director Anthony Chua said although the demand for residential properties continued to be high, the credit-tightening measures by banks had resulted in the market “cooling somewhat”. “We are still monitoring the situation. There is less transactional activity in the market this year for both new property launches and the secondary market compared with last year,” said Chua. Property consultancy CB Richard Ellis (M) Sdn Bhd had, in its recent report on the Kuala Lumpur residential market for the second quarter of 2012, also noted that there was a significant decline in the loan approval percentage this year. “The loan approval rate was as high as 60.5% during the first five months of 2008, and has declined steadily since,” said the report. The CBRE report said that the lower rate of loan approvals this year could be attributed to the implementation of new lending guidelines by Bank Negara. Effective this year, banks have started using net income instead of gross income to calculate the debt service ratio for loans. The property consultancy also pointed out that despite the lower loan approval rates, buyer interest in new property launches, typically of smaller housing units in secondary locations, during the second quarter remained strong with developers continuing to offer attractive incentives to the purchasers such as the developer interest bearing scheme (DIBS), early bird discounts, free built-in cabinets and free legal fees. The CBRE report also said speculative property purchases were expected to be reduced for the rest of this year, as a result of tighter lending conditions, uncertain economic outlook, and concerns about the outcome of the upcoming general election. Meanwhile, another property consultant said the tighter lending conditions had taken a visible toll on the secondary residential property market. The consultant said slower sales activities in the secondary residential property market had resulted in innovative offers from marketing agents. “This includes transactions where buyers sign the sales and purchase agreement but take the bank loans only a year or twolater. In effect, the buyers lock in the unit price now (perhaps in anticipation of further increases in market prices) and defer payment until much later. This works just like an informal DIBS,” he said. In a recent report, Kenanga Research also said based on its channel checks, the secondary market appeared to be very weak and prices of secondary and primary products have diverged further. The research unit opined that buyers were more focussed on new launches due to financing and promotional schemes. Kenanga Research also opined that as a result, property developers can continue to grab greater market share and chalk-up high sales, although it expected Malaysia's overall residential transaction value growth to be relatively unexciting at 5% year-on-year. It was noted that despite the tighter lending criteria, Malaysia's total residential transaction values have remained stable in the first quarter of this year.